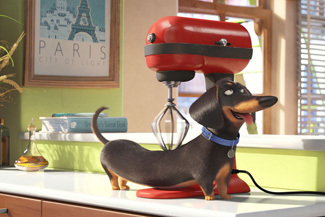 Almost nothing at all actually happens on a plot level in The Secret Life of Pets, which is why it's both impressive and necessary that it provides the subtext that it does in order to stand out in any way it can. The movie consists of roughly 30 minutes’ worth of story augmented by stock characters, but in its heart lies a surprisingly consequential narrative about idealism and ideology and the speed and totality with which those things can end in disaster. That sounds pessimistic for a family film, and I hasten to add that this is absolutely a movie from the mind of Despicable Me’s Chris Renaud: it's a brightly-lit, searingly-colorful, kinetic animated fantasy with a cast of characters seemingly modeled on amorphous blobby shapes, surrounded by architecture and infrastructure reminiscent of the Magic Kingdom’s Main Street and approximately as functional. The environment looks terrific, and there are a lot of little personality touches and flourishes that are just right. It’s a chipper, energetic movie that ends up doing about what we expect it to; I confess that I wished for more, and that’s fair because the movie insinuates grander goals to begin with. In a stylized and rather period-nonspecific iteration of New York City live a building full of human and non-human tenants; we meet all of them in an opening montage that's simultaneously a neat introduction to a large cast and a clip show that runs about a minute too long: Max (Louis C.K.) lives with his owner Katie (Ellie Kemper), and life is bliss. Every day she goes to work and he spends the day socializing with the building’s pets, which include Gidget (Jenny Slate), Chlöe (Lake Bell), Mel (Bobby Moynihan), Buddy (Hannibal Buress), and Sweet Pea (Tara Strong). Then, one day, Katie brings home Duke (Eric Stonestreet) a giant mixed breed that seems to be mostly Newfoundland. Bliss shattered, Max and Duke have an immediate dislike for each other, manifested in seemingly zero-sum acts of subterfuge. Things get more complicated when the two find themselves separated and lost in the below ground sewer system with a gang of “discarded” pets, now bent on overcoming the humans.